We’ll get a handle on the must-know considerations regarding food in zero gravity, and food on Mars. We’ll eat and begin our research. 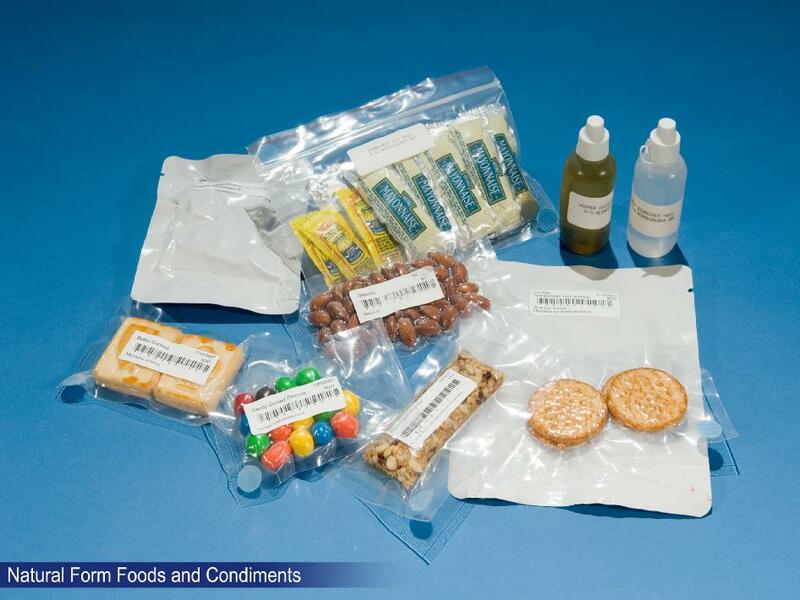 SPACE FOOD rules for the microgravity in Low Earth Orbit at the International Space Station (ISS). Eating in space is complicated. Most food is stored in individual meal pouches. There are condiments and snacks, but all need to be sealed and contained to remain fresh and to keep crumbs and stray pieces from getting everywhere. Crumbs are a real problem aboard the ISS–in near-zero gravity they float around the cabin and can easily get into eyes and hair. Salt and pepper have to be applied as a liquid (see below the small squeeze bottles on the upper right). The packets will float around the cabin unless their packages are held down to the table or tray by straps, velcro or magnets. 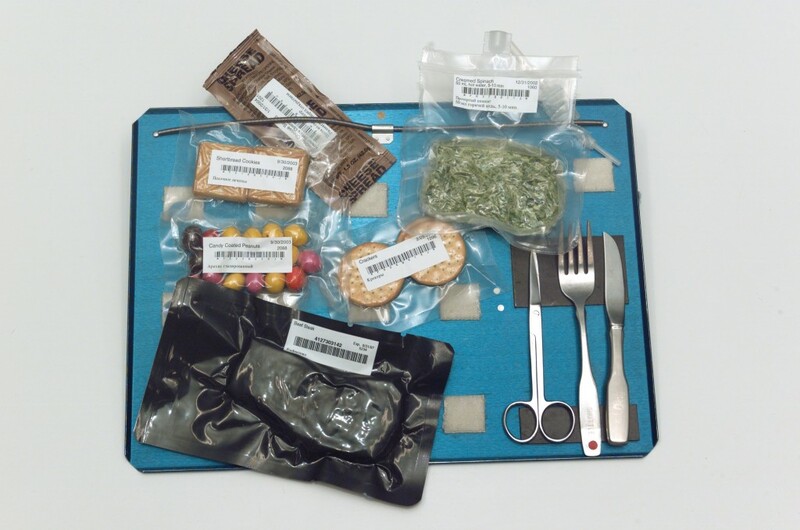 There is no actual cooking on the ISS, sealed meals are heated up in a toaster-like food warmer, cut open with scissors and eaten directly from the pouch. 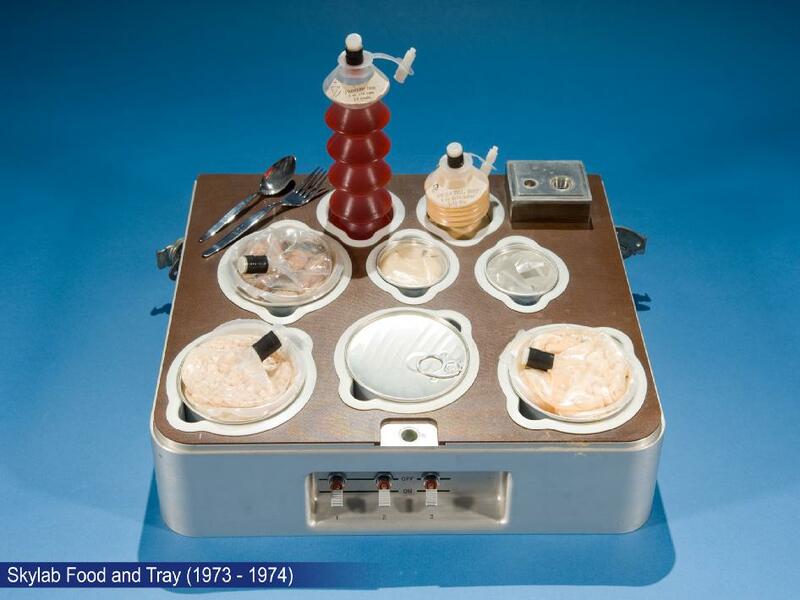 During the Skylab mission, meal trays had special slots to warm food directly in the tray. Getting food to the ISS requires a lot of logistics. Astronaut meals are chosen ahead of their mission, with a combination of standard meals and special-choice meals, on a rotating 16-day menu. 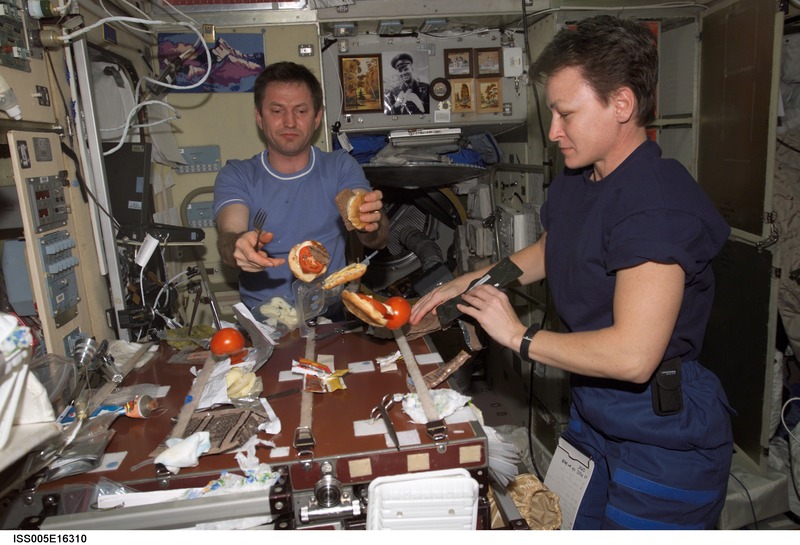 Half of the food comes from the US side and half comes from the Russian side of the ISS. Astronauts usually get one “bonus” container a month which can consist of anything which does not require refrigeration and that passes NASA microbiological tests. This is a typical breakfast for an astronaut. Here is what space shuttle commander Steve Lindsey chose for breakfast during flight day 2 on mission STS-104. 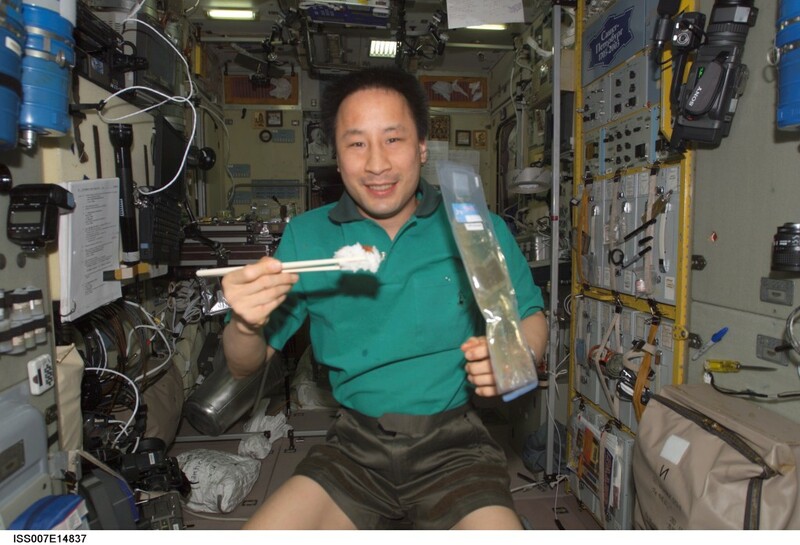 When adapting to space flight, some astronauts have reported that their tastes changed, and that in space they tended to like spicier foods. One of the reasons for this is related to congestion that astronauts sometimes have, similar to a stuffed nose during a cold, caused by fluid redistribution in the body in microgravity. 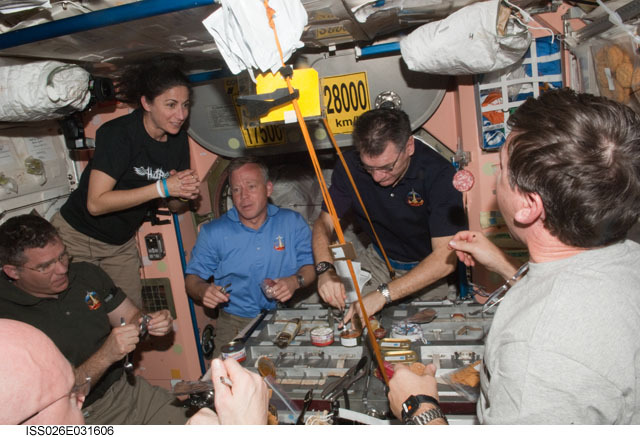 Most of the ISS crew members say that this is noticeable only in the early days of the mission, and that after a week or two, foods taste great. 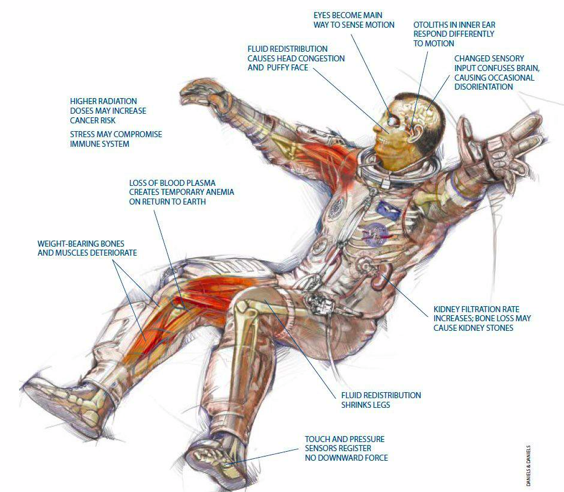 Health and nutrition issues related to being in space include: bone loss due to lack of gravity, vitamin D deficiencies (related to bone health; generated by body naturally by exposure to sun; no sun on ISS because of radiation shielding), vitamin K deficiencies (related to bone health; related to microbacteria in body; blood coagulation) and generally the treatment of food and long shelf life results in depleted nutritional value. 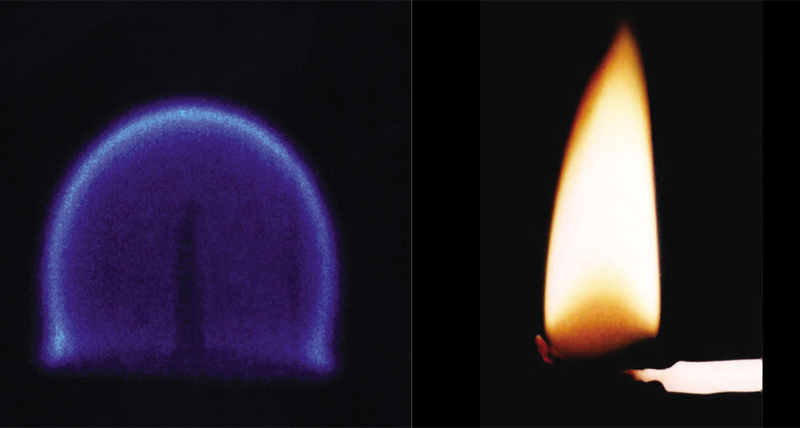 There are other physical effects of near-zero gravity, like strange behavior of flame–on the left is a candle burning in zero gravity, and a candle here on earth on the right. Without gravity, hot air expands but doesn’t move upward. So being in space means adaptations on many levels–including traditions. 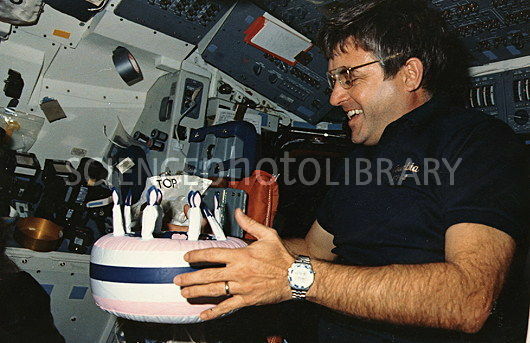 Since cakes have lots of crumbs and flames behave unpredictably, birthday cakes are not practical in space– but substitutions can be made, such as the inflatable cake given to Mission Commander Daniel Brandenstein. Given these logistics and physical considerations for eating aboard the International Space Station, we can start to imagine what food might be like on Mars. How will the conditions on Mars affect the menu? Like other Martian analog efforts here on earth, where the conditions on Mars are emulated and tested for practice, we can examine Earth menus and glean information from experts to see what might be adapted for existence on Mars. 1. COLD. Mars is much colder than Earth with a mean surface temperature between 186 and 268 K (−87 °C and −5 °C). The lowest temperature ever recorded on Earth was −93.2 °C, in Antarctica. In other words, your blood will boil if you go outside without a pressurized spacesuit. 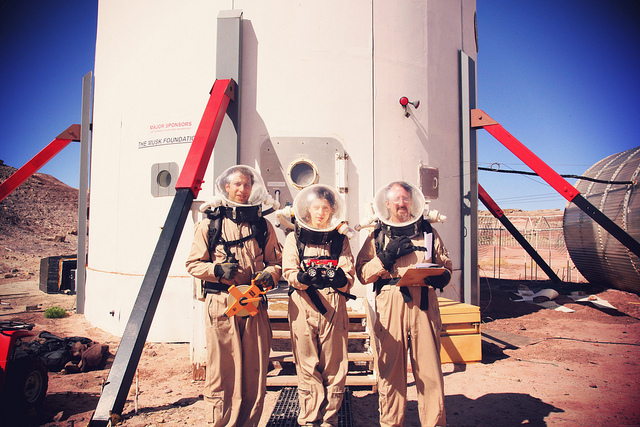 Habitable structures on Mars would need to be pressurized like spacecraft. 1. Living entirely within a sealed, spaceship-like environment, including any greenhouses. 2. Cooking methods altered. Cooking with a pressure cooker likely. Can there be flames or barbecue in 38% gravity? 3. 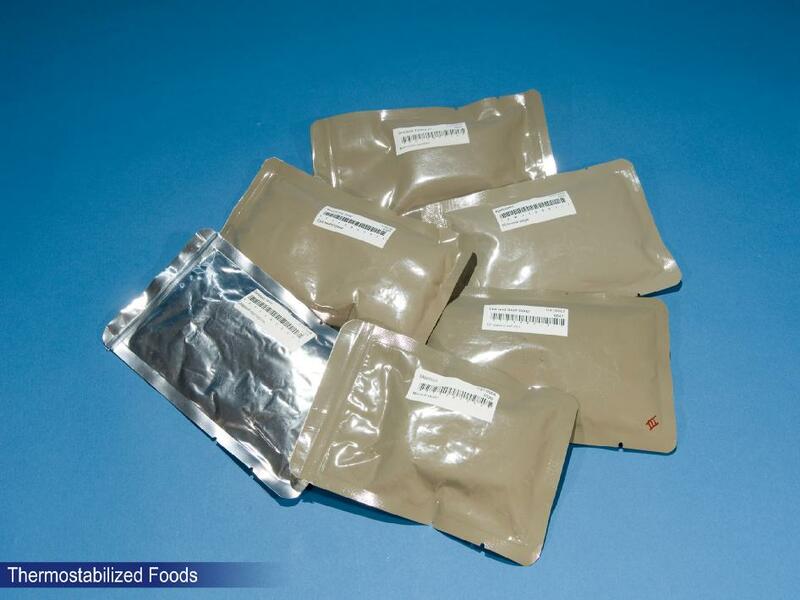 Food from earth highly preserved, packaged for 5 year shelf life. Shipments might only arrive once every few months. Missions to Mars have taken 128-333 days in transit. 4. Fresh food. Greenhouse growing an untested challenge, many unknowns in terms of growing season, light, gravitational effect. Can some crops not often traditionally eaten on Earth grow well on Mars, such as algae, fungus, insects? What about preserving grown food? 5. Would persistent dust have a flavor or texture effect? Goal: Glean food knowledge from food and restaurant experts, compiling recommendations for Mars mission planning. • particular cooking methods noted—would these work on Mars? • how many of the items on the menu are preserved (come from cans or are dried) vs. fresh? What is your favorite item on menu? What could you live without (forever)? What is the most common ingredient or flavor? What is the most important ingredient or flavor? If you could only have 5 ingredients to cook with for a year, what would they be? • do any of these things grow well in greenhouses? • do any of these items grow well in cold? • are any particularly hardy or delicate? Regarding food preparation: how would you handle cooking in an extremely dusty environment, where dust sticks to things? Are there particular things you’d do to keep the dust out of the food, in cooking and in storage?